Pot brownies are fine, but why is it that stoner chefs are so complacent to just keep making the same thing over and over?! Oh, right. 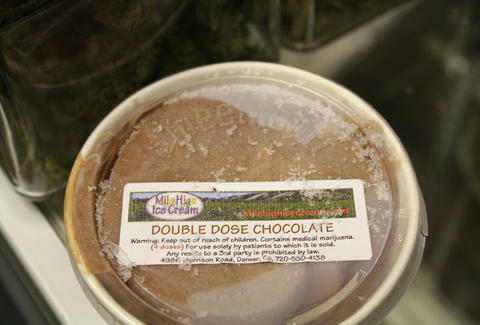 For a new treat that melts in your mouth and goes straight to your head, slowly reach for Mile High Ice Cream. Now available at your local dispensary and just dropping a new pumpkin seasonal flavor, Mile High's the Boulder-based, heady side-project of the guy behind more traditional Glacier Ice Cream, whose new business plan was suggested by his 20-year-old son, making this guy so much cooler than your dad. The cream's crafted in a fully-licensed separate kitchen (so no chance of Granny getting surprised by her Glacier scoop), where concentrated cannabis is added to all-natural dairy from Colorado cows, sugar, and vanilla, before being hand-mixed with other flavor-specific ingredients like imported chocolate for their Boulder Brownie, or fresh-roasted local nuts for their Mota Almond Fudge and Peanut Butter Kush Cup, which like Reese's, there's no wrong way to eat, except while operating heavy machinery. More awesome varietals (they've currently got over 60 flavors) include the uber-popular Bing Cherry, Vanilla Bud (which the GM of The Releaf Center recommends throwing in root beer), Chocolate Cookie Dough with "just enough flavor to let you know it's there, but not enough that you should've just started licking buds", and Strawberry Pot Tart -- all of which're available in "double strength" doses, for those pushin' for more kushion, not cushion. They're also planning on releasing a brand new Peppermint Stick for the holidays, which'll go great with that tree that's been in the living room since last year.